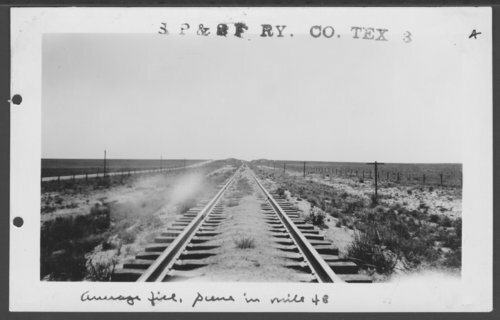 These two black and white photographs show track lines along the South Plains & Santa Fe Railway. The first image shows mile post #48 while the second image shows mile post #51. The rail line was a subsidiary of the Atchison, Topeka & Santa Fe Railway Company that ran from Lubbock, Texas, to Bledsoe, Texas.